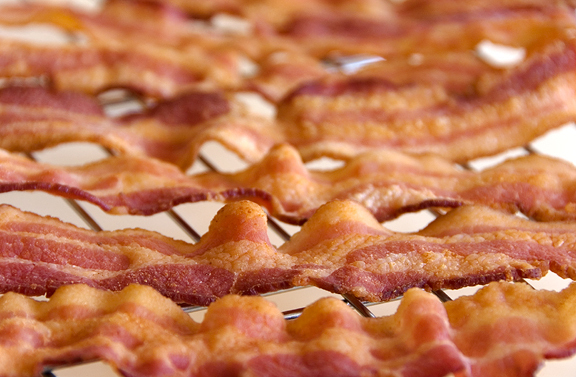 Bacon, it could be kosher! Yom Kippur came & went this week. It began on Monday night & ended Tuesday night. This is the high holy day in Jewish tradition, it is when the High Priest made atonement for the people according to Leviticus 16. This is a sacred holiday which even the nominal Jews respect. It may be equated with the Christian Easter holiday. It certainly is a high point. I listen to sports radio. Sports radio is mostly run by Jewish men who take their faith fairly seriously, in word at least. For instance, on my way home from work last week, they had a very entertaining guest on for an interview. The guest was loose, the atmosphere was relaxed and they were making fantastic radio. Then, the guest chose to describe how frugal he was with his money by calling himself part Jewish. Needless to say, the conversation grew awkward & he was booted off the air. The host said, "You can't say that." A few days later, a co-host was complaining that he was going to have to spend the whole day on Tuesday fasting. He was upset that he would not be allowed to eat anything & wanted to come into work to make the day pass quicker. However, he was bound by sabbatical rules against excessive work. The very next day, he tweeted that he was eating a bunch of bacon, no comment if it was kosher. It appears that Christians are not the only hypocrites in the religious world. That should come as no surprise. Does it excuse our behavior? No. We should be a genuine people who do what they do for a real purpose. We should be educated & able to explain the significance in our rituals. Further, we should be consistent and live out our faith the same way in every situation we find ourselves in. Sadly, it doesn't work out that way. I don't share this story to be anti-semetic, I use this anecdote as a mirror to my own life. Is there an area where I fail to lead a consistent life? I pray that I am sincere in everything I do.